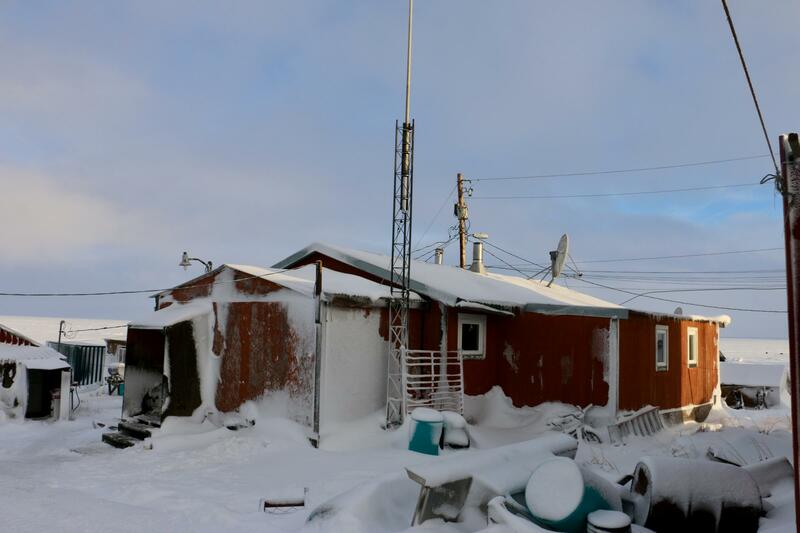 Villages like Newtok, Shishmaref and Kivalina have become well known for being on the front line of Climate change, but many other communities are facing erosion and flooding issues. Chefornak, in the Y-K Delta near the Bering Sea coast, is one of those villages. 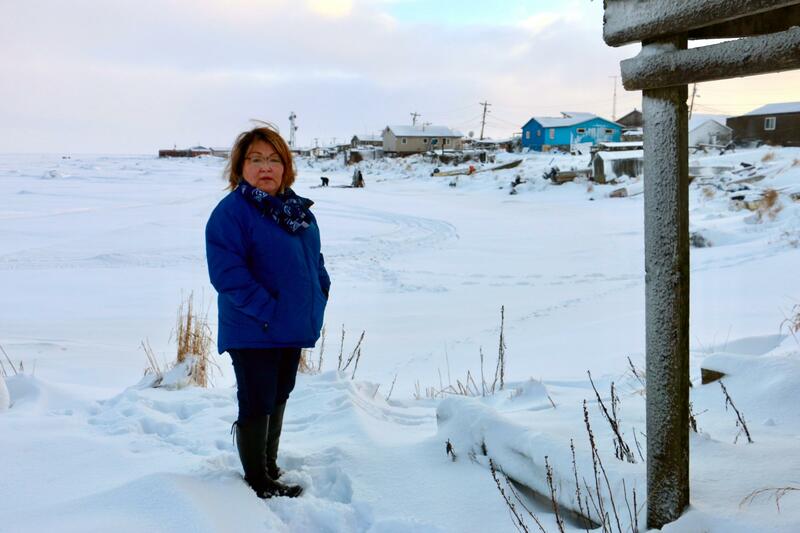 KYUK continues its look at climate change and how Chefornak’s villagers are facing the future. On a crisp and clear Saturday morning, Rosalie Kalistook, known as Rose, walks down to the edge of her aunt’s home. Standing next to a fish drying rack, Rose points several yards across the snow to the shoreline. It’s mid-December, and some men are out on the ice fishing for blackfish. Kalistook is the General Manager of the Chefornak Village Corporation. She points again, this time farther down the shore. “And you see that house up here? Their steam house is ready to go, and next will be their home,” Kalistook said. Kalistook gestures farther, indicating several more buildings. At her parents’ home, just behind her aunt’s house, her 79-year-old father Paul Tunuchuk shares memories of the old village of Chefornak while his 18-year-old granddaughter Alexia Aylyuk translates. “From old village over there… easy to flight. That’s what this move was, [it] was higher right here, [in] this village,” Tunuchuk said. “So he’s saying that it was a lot more easier to get floods over there than over here, so we all just moved the village up to a higher place just to be safe. We all just moved, took our things, used a boat, kayak. We just started from there, I guess,” Aylyuk said. More than half a century later, it’s Tunuchuk’s daughter Rosalie Kalistook who is trying to find a way to move the village again. She’s searching for both higher ground and the money to move what’s been built since, which is considerably less movable and more expensive. After Kalistook came on board, the corporation put two Chefornak college students to work on a community survey. “The outcome of the survey came out that the concern of almost every home is erosion,” Kalistook said. That survey became the basis of a five-year strategic plan. And one of the students, Eric Tunuchuk, is working with Max Neale at the Alaska Native Tribal Health Consortium to apply for grants for Chefornak. The price tag? It’s estimated that the cost of building a seawall to protect the village of less than 500 people will cost $25 million. Funds from grants they apply for now won’t be arriving for a year or more. To make their case they also need data on erosion, potentially from community monitoring programs now being put together by the state government, Alaska Ocean Observing Systems, and the Alaska Institute for Justice, which is already working with several Y-K Delta villages. Executive Director Robin Bronen says that the goal is to keep data collection simple and easy. The big problem is that erosion does not qualify as an emergency under the Stafford Act, the law governing the federal emergency program. Bronen says that gathering data will help prove that erosion, in the face of climate change, is no longer slow moving, but a real emergency. “What’s actually happening in communities shouldn’t be called erosion because it’s happening much faster,” Bronen said. Bronen says that the price Alaska’s coastal communities are now paying for the loss of the protections ice and permafrost once provided against erosion, storm surges and flooding, is beyond an environmental problem. It’s a human rights challenge. “The right to self-determination is the most critical right to protect when you’re talking about the way that climate change is affecting the habitability of the places where people have lived for generations,” Bronen said. Back at Kalistook’s father’s house, the television plays in the living room while the elder contemplates ways to combat the erosion and flooding that is once again threatening his village. The walls of the Tunuchuk home are covered in photographs of loved ones: those that have passed on and those that remain. Tunuchuk says that one of his favorite things about Chefornak’s current location is its proximity to good fishing. “Lots of fish around here. That’s why [we] moved right here,” Tunuchuk said. A moment later, a family member hauls in a big bag filled with wriggling black fish. “Fish, blackfish…” Tunuchuk said with a smile. 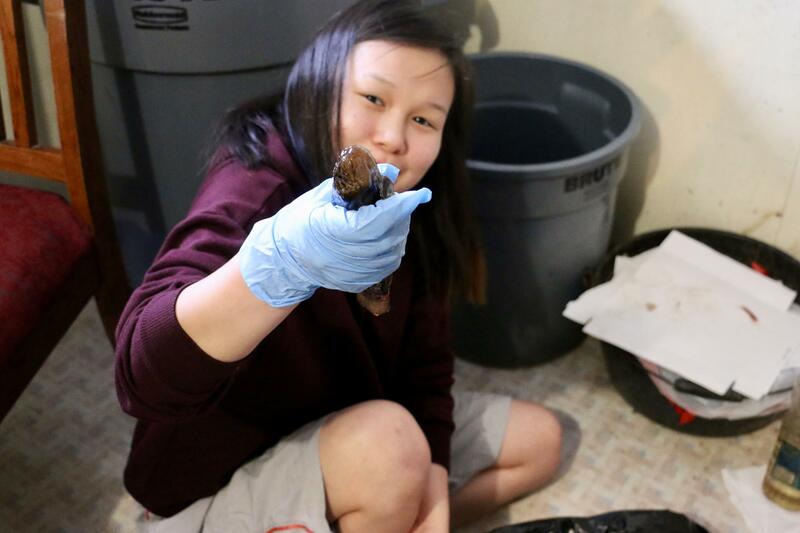 Next fall in Bethel, a climate change workshop will be offered to Y-K Delta communities by the U.S. Fish and Wildlife Service through the Western Alaska Landscape Conservation Cooperative.